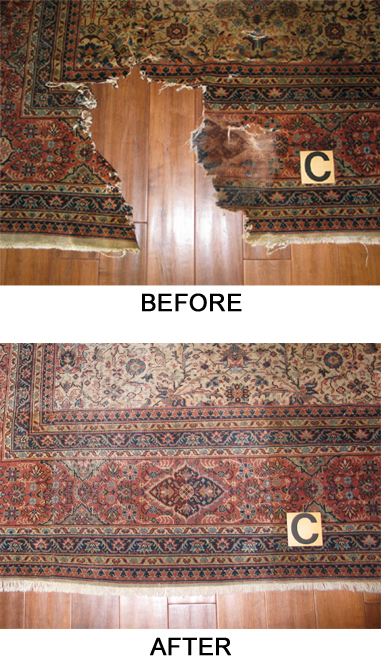 Persian rug repairs Beverly Hills are provided by Antique Rug Company’s repair workshop. Bring your rug to our rug showroom and workshop or call to schedule pick up. Your handmade rugs are works of art. Antique, vintage, collectible, family heirloom or new, all rugs are valuable and should be maintained over time. To best maintain value and condition of your rugs we recommend following the maintenance suggestions in our RUG CARE section. But when accidents happen and cause damage, it is best you seek repair advice soon to avoid additional damages. 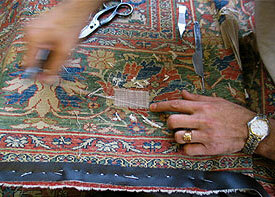 Experienced rug weavers at our workshop provide valuable maintenance, repair and restoration consultation and service. 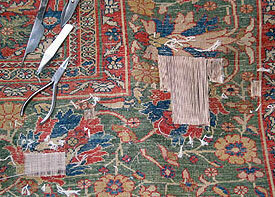 We have repaired all types of rugs over the years. 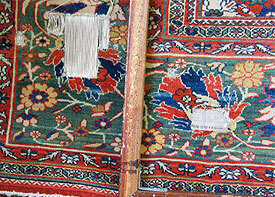 Any handmade or machine made area rug, Oriental, Persian, Navajo, mechanical or other type, can be improved or restored.